Taste your way through one of the largest Chinatowns in the Western Hemisphere! 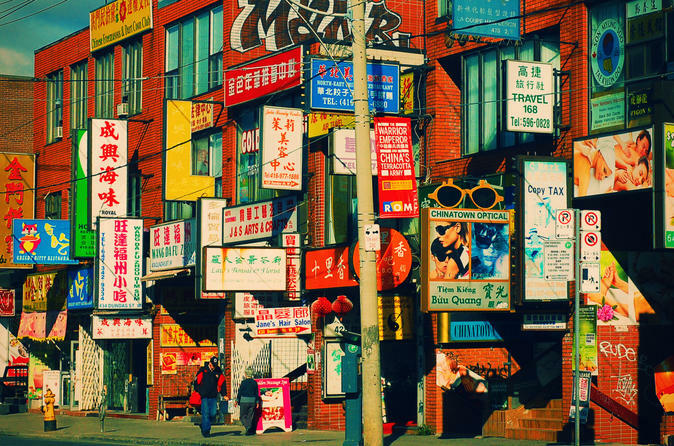 Sometimes referred to as the original Chinatown, it is one of seven in the Greater Toronto Area. This neighborhood is a beehive of activity with shops, cheap housewares, fruit and vegetable stalls, traditional Chinese herbal medicine dispensaries and of course, tons of great food. It can be a pretty intimidating place for those who are unfamiliar with the food and customs of the Asian culture. Let your knowledgeable guide lead the way through a tutored tasting where you will learn the history and culture of the community. Hear about one woman's fight to keep the community from being demolished as well as tidbits of etiquette and ancient customs. So “chī hǎo hē hǎo” 吃好喝好 which literally translates as “eat well and drink". Your uniformed guide will meet you at the south-west corner of College Street and Spadina Avenue where you will set out on a walking tour that will showcase six different authentic Asian eateries. After a brief history lesson of Toronto, set off for your first tasting at a traditional Chinese bakery for an authentic delicacy that celebrates the Cantonese Festival of Spring. From here, you'll duck into a hole-in-the-wall joint that makes the best char sui boa in Toronto. Next up, you'll visit one of Chinatown’s oldest and most authentic restaurants to taste a dish from the Fukin province of China, that Chef Scott likes to nickname “Chinese Risotto”, along with the best dry-fried squid in the city. A few steps down the street, you'll get to taste and watch as a favorite street vendor demonstrates his family’s version of a Chinese crepe. Then it’s off for a Hong Kong dim sum experience where you will sit and taste four original dishes while learning the history of dim sum and its traditions. Walk off the feast by browsing an Asian food market before making a pit-stop for “window food”. Last but not least, to bring out your inner chef, you'll end the tour at Chef Scott’s favorite kitchen store which is a venerable “candy land” for some of Toronto’s top chefs. The tour includes all of preselected food and beverages (ten authentic Asian dishes) and restaurant gratuities. Tour guide gratuities are graciously accepted at your discretion.